The Dell 2135cn Multifunction Color Laser Printer offers professional-grade color printing along with a host of features designed to conserve resources and help reduce costs. The 2135cn allows you to print, copy, fax and scan, yet eliminates the hassle of managing four separate machines. In the long-run, the 2135cn Multifunction Color Laser Printer is easy on your bottom line with low cost-per-page monochrome and color prints. Enjoy professional-quality color-laser printing with 600x600 dpi print resolution. Get fast output of up to 12 pages per minute (ppm) color and up to 16 ppm monochrome with up to 40,000 page monthly duty cycle (actual print and copy speed will vary with use). Image quality is optimized without any user-intervention. Simplify networking with the Dell Printer Configuration Web Tool, a browser-based interface that allows you to change settings anywhere you have Web access. Choose which users have access to color printing and minimize usage of color toner with Dell Color TrackTM 2.1. Print in black without disruption if color toner runs out. Ease inventory management with the Dell Toner Management System, which automatically notifies you when toner levels are low so you can order supplies before you run out. Purchase Dell replacement toner through online for added convenience. 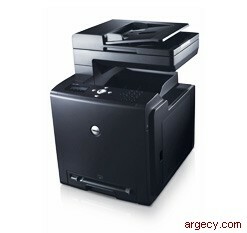 Dell 2135cn MFP is Energy Star certified. On average, Energy Star qualified imaging equipment is 25% more efficient than conventional models according to the US Environmental Protection Agency. (Source: www.energystar.gov). Reduce materials and energy consumption with a multifunction system that performs the functions of 4 separate machines - a printer, copier, scanner and fax. Simplify toner-cartridge recycling with prepaid return postage for empty toner cartridges. Monitor the types of jobs being printed and toner levels almost anywhere you have web access. Help reduce your long-term costs with advanced printer monitoring capabilities that allow you to manage resources office-wide from a central location. The Dell ColorTrackTM 2.1 color tool offers the ability to enable, disable or set limits for color and mono printing. Pair the ColorTrackTM 2.1 tool with the Dell Printer Configuration Web Tool to manage your printer fleet effectively and remotely.